Pacific Union College welcomed Paralympian Scout Bassett to speak for the Colloquy Speaker Series on Thursday, May 25. Bassett shared her incredible and inspirational story, from an abandoned infant in Nanjing, China, to competing in last summer’s 2016 Rio Paralympic Games. She believes she owes her success to determination, hard work, and most of all, God’s leading in her life. Bassett lost her right leg in a fire when she was only an infant, and shortly after she was found abandoned on the streets and brought to a government-run orphanage, where she would live for several years in harsh conditions, unable to walk because of her disability. When she was seven, she was adopted by an American family and moved to a small town in Michigan. She was the only minority as well as the only disabled person in the entire county. Bassett struggled in school and desperately searched for a way to fit in. It wasn't until the age 14 when she was introduced to the Challenged Athletes Foundation and was given her first running prosthetic she felt she found where she belonged and could achieve anything she wanted with her life. “It changed the course of my entire life. … I had searched my whole life to find something I was passionate about, something that gave me a sense of purpose, hope, and meaning in my life. I didn’t know what that was until I put on that running leg and I ran for the first time. I said ‘This is what I’m born to do, I know my calling,’” Bassett shared. At the time, she was failing school and didn’t have any college ambitions, but with her newfound confidence thanks to participating in sports, she applied herself, and earned a full-ride scholarship to the University of California, Los Angeles. After an extensive amount of training, Bassett competed at the 2012 London U.S. Paralympic track and field trials, and finished in last place, which was devastating for her. She thought her time as a runner was over. Following graduation, she worked at a medical device company for three years, afraid of going after what she really wanted. 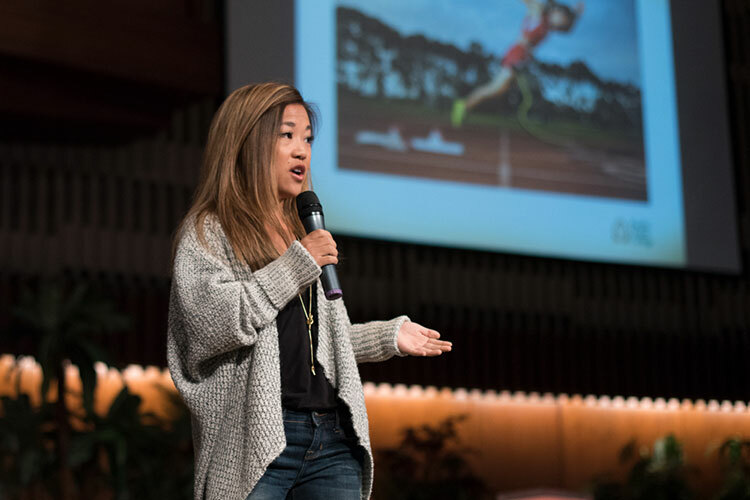 One day Bassett felt God’s calling to quit her job, even though she didn’t have a single sponsor, and a few months later, she was living out of her car, sleeping on friends’ couches, and eating ramen while she trained in San Diego. She was determined she was going to work hard and knew God would take care of her. “Your trials, your challenges, your struggles—embrace them, because they are paving the way to excellence,” she said. Bassett began to break world records and soon Nike called wanting to sponsor her. She felt her success came after years of trusting God’s leading in her life and her hard work. Last summer, she competed at the 2016 Rio Paralympic games and finished fifth overall in the world. Though she was disappointed in her standing, she continues to train for the 2020 Tokyo games. Talking about her process, Bassett encouraged the audience to not only follow their dreams, but to put in the hard work to get there. “Goal setting isn’t the differentiator, because guess what, a lot of us have the same goals. We all want to be successful, we all want to win, make good money, get a promotion. Setting goals is important but that alone isn’t going to get you there. No one will do the hard work for you. You’ve got to be the one who says, ‘I’m committed,’” she said. Through it all, Bassett counts everything she has been through as a blessing. Recently, she went back to China and visited the same orphanage she grew up in, facing a lot of her fears and years of pain. She was able to see how God continued to work in her life and use her to say things to the children there things no one had said to her as a young girl: they are worthy, they belong, and they are loved.